ACRYFORM and Perspex is the new alternative to glass for splashbacks, balustrades, signage, decorative panels and shop fittings just to name a few, according to Hamilton Australia Pty Ltd.
Having similar physical properties to its glass counterpart, it has come to be a force to be reckoned with. It is easier to fabricate on site, lighter in weight and safer because it won't shatter. It can be slumped as an Acryform panel in a matter of hours and can be easily moulded to suit a variety of applications. Acryform can be back sprayed any paint colour available to match any décor or to make a spectacular feature piece. The Acryform used in a splashback has begun to take its rightful place in the market and is recognised as a preferred selection to glass, especially for tricky spots. Now available in the Perspex range are the Alifrost and Alimesh range of aluminium doors and panels with Perspexor anodised mesh inserts. Perspex comes in a range of 14 Frost colours and 5 Pearlescent colours and four different edgings. 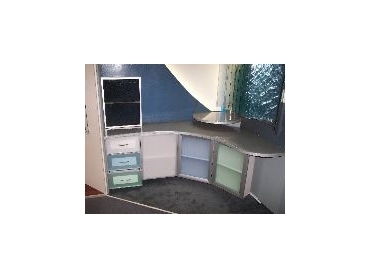 An example of the Alifrost doors can be seen in the Big Brother 06 house kitchen pantry.